I think this easy salad is a taste sensation. The combination of flavors and textures really makes it a delight to eat. 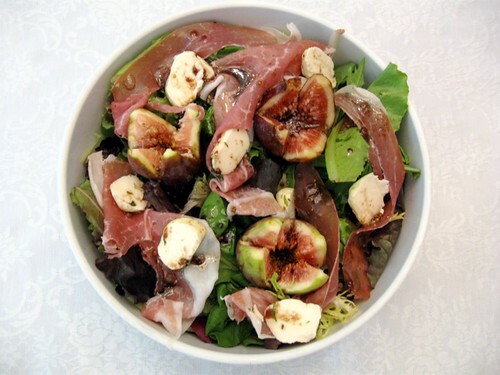 The figs are sweet, the lettuce leaves are crunchy, the prosciutto is salty, the salad dressing is a bit tart, and the mozzarella is soft, mild, and seems to balance the salad. Prepare the balsamic vinegar dressing. Combine the mustard, salt, pepper, garlic, and vinegar. With a whisk in one hand, and olive oil in the other, slowly emulsify the olive oil into the other ingredients by pouring it in slowly and whisking vigorously. Assemble the salad. Cut a crisscross into the figs, without cutting all the way through. Squeeze the bottom of the fig a bit to expose the pink flesh inside. Place lettuce on the bottom of the bowl, and distribute the other ingredients on top. Just before serving, lightly dress the salad with the dressing. Alternatively, you can leave the dressing on the side so that people can choose the amount of dressing, if any, they'd like on their salad. Thank you for a wonderful recipe! My family is looking forward to tasting the salad this evening. It should make for an excellent addition to our Thanksgiving feast!! I ran across your blog and thought that the pictures were really beautiful and that the recipes seemed straightforward not too difficult and delicious. My brother and I recently published a cookbook called "Freshman In the Kitchen: From Clueless Cook To Creative Chef"
I think we share the same interest in making people excited and comfortable about cooking. The idea behind our cookbook is to inspire young people ages high school - young adult to overcome their reservations about getting into the kitchen and cooking great fresh and easy dishes. If you would be willing to host a recipe or comment on our cookbook we would be very grateful and we are always down to talk about food! Love this recipe!! It is so beautiful as well as yummy (or num as my family says). I use dried fruit so much in my cooking. I believe it's my love of Moroccan cooking. Figs I haven't used so much, but there are these great orchards here in WV and I should utilize them. Thanks for reminding me.